Last year I made a resolution that I would only read books in Spanish. I had just moved to Mexico and was determined to perfect the Spanish language. The goal of only reading Spanish books was a big one, but perhaps not so hefty as attempting to ‘perfect’ the language. Over a year later I am still not quite there, my spanish is passable but far from the real ‘p’ word I was aiming for… but I did power through over 10 novels in Spanish during 2014. At the time I thought that was the big tick – reading books in another language. But the real learning from my year long resolution came in early January, when I was ready to pick up my first English book in over a year. I happened to be away for the weekend staying in a tiny town in the middle of Mexico and stumbled upon a book in English on the bookshelf. When I say tiny, I mean the town comprised of 100 inhabitants, who were spread over four generations and all related. So it was actually quite amazing that there happened to be a book on the shelf in English at all. Naturally I picked it up and dived straight in. The book was James and the Giant Peach, by Roald Dahl. A story I was familiar with, but had not read or even thought about in over two decades. It is a unique and imaginative story about a boy called James who, surprise, surprise, has an adventure inside a giant peach. There is magic, talking insects, flying peaches and a dramatic arrival in New York. I was surprised with how absorbed I was in the story, how it reminded me of what it was like to be a kid – when you question things, and don’t construct your answers built on past experiences and accumulated knowledge. I felt a dormant part of my brain come alive as I read the life learnings from the view of the Old-Green-Grasshopper and saw the magical components of James’ adventure be painted so vividly. Not only did I love being reminded that there is so much more to this world than humans but that also ears on the side of your head is not the norm – grasshoppers have them on their stomach and for crickets they are on their legs – and that on average centipedes have 42 legs not 100. 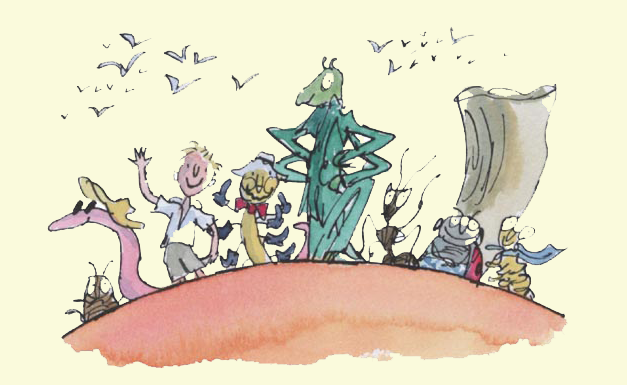 Original illustration by Quentin Blake from James and the Giant Peach. I feel like so much of what I normally read; biographies, business books, classics, historical fiction and even most Man Booker Prize winners, I do so with the purpose of learning something specific. I want to better understand the person, the culture, the economy or the theory it centres around. But with James and the Giant Peach, I had no desired outcome. I just read the book, because it was the only thing in my first language available. And it was bloody fabulous! Had there been other options to choose from I am sure I would have selected many other titles before picking up this classic Roald Dahl kids’ book. But reading something short, easy, creative and a little twisted made me smile and feel inspired. After a whole year of stretching what I thought was all my brain cells to decipher my Spanish novels, I found some new ones reading this children’s book. So this year I am going to make it a priority to read more kids’ books. To read with no other purpose than seeing the world through the creative eyes of a kid again, and keep me wondering about the world and all its’ possibilities. Maybe you should try it too? Great mindpath Sar. Wonder why it was a surprising read?